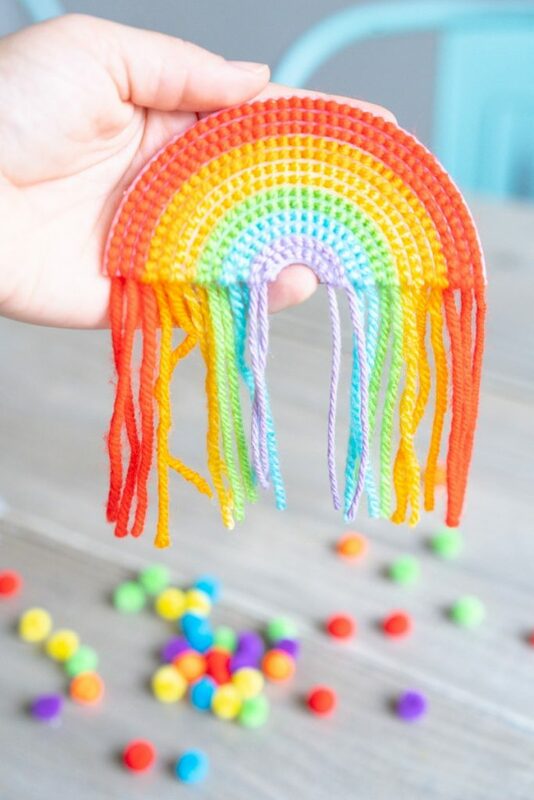 If you were ever a Girl Scout or went to church camp, you probably remember making something similar to this plastic canvas rainbow craft. Kids of all ages will love making this for St. Patrick’s Day, spring, or any festive holiday! 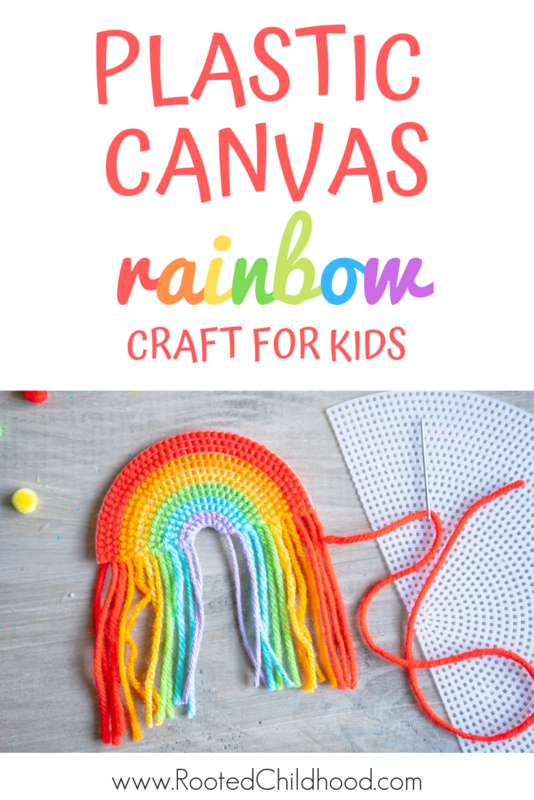 Plastic canvas is a great option for young crafters. 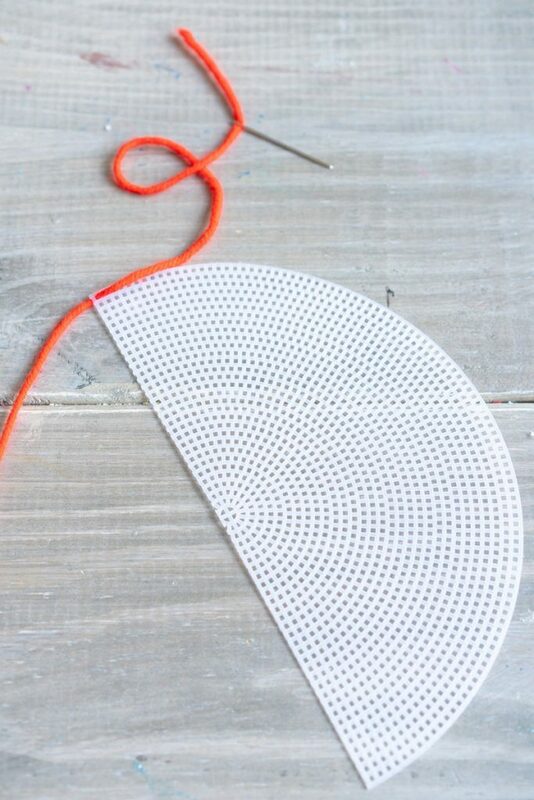 The open grid makes it easy to pass the needle back and forth through the canvas, and making patterns and shapes is easier than on just a plan piece of fabric. Try this project with kids 3 and up. Most 4 year olds will be able to complete the project with some assistance and most 5 year olds will be able to complete the project pretty independently. Choose a canvas size appropriate for the child. You want them to be able to complete the project without a lot of frustration. As a general rule, use a smaller canvas for younger children. You’ll also want to take note of the size of the openings. Standard plastic canvas will usually be notated as “7 pt” as it has 7 openings per inch, and this is what I would recommend for children. 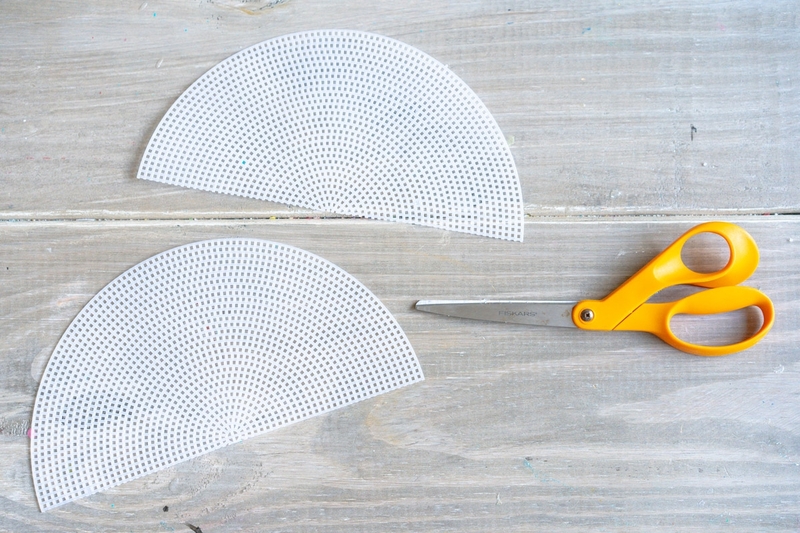 When shopping online or at a speciality hobby store, you’ll find a variety of plastic canvas with smaller and larger openings. Use a plastic canvas needle. Plastic canvas needles have an extra large eye perfect for threading yarn or ribbon and a blunt tip, which is great for younger children. If you don’t have plastic canvas needles on hand, tapestry needles will work. 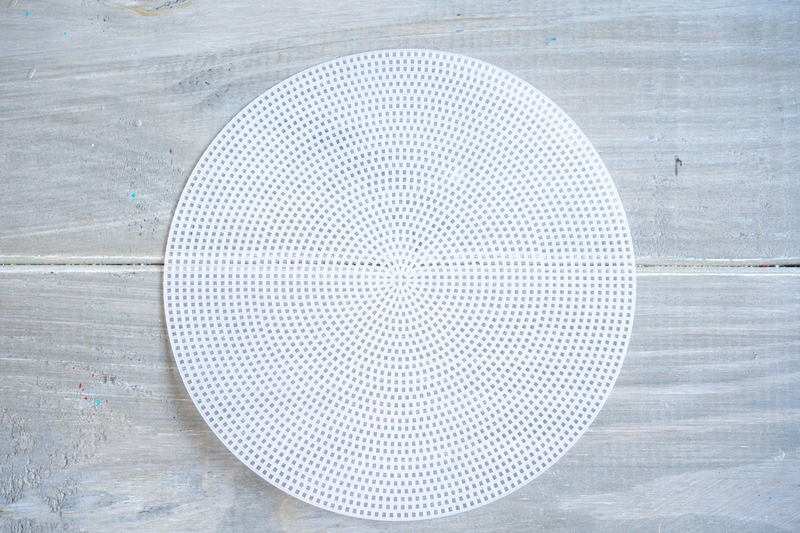 Begin with a round plastic canvas. Cut plastic canvas in half along the grid lines. Decide how many rows of each color you will do. 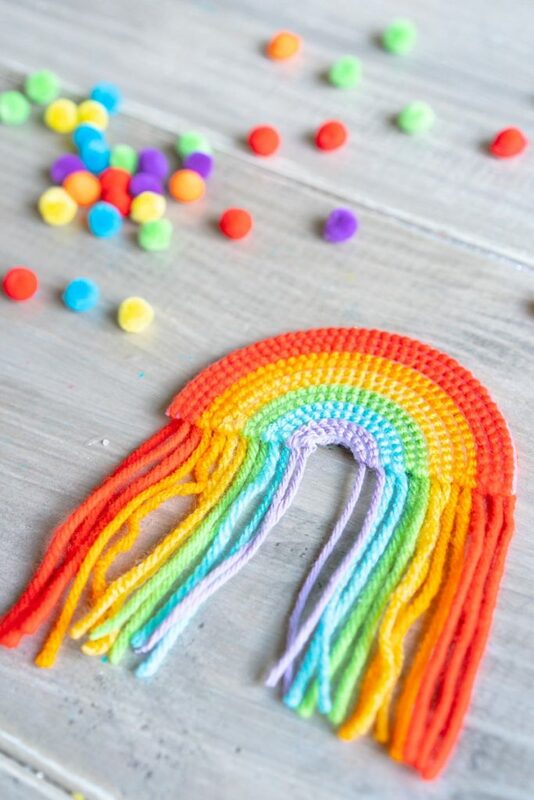 You can fill in the entire canvas, or if you have extra rows at the center of your rainbow, you can cut those out to help form the rainbow shape. 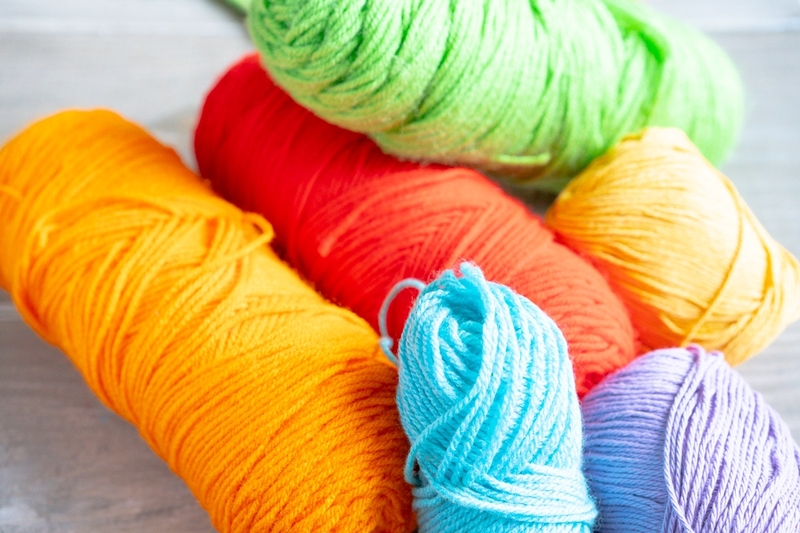 Thread the needle with your first color of yarn. Tie a simple knot and check to see if you can easily pass through the plastic canvas. If the knot makes it difficult to pass through, pull extra thread through the eye and allow it to hang loose. Begin on one end of the rainbow by threading the needle up through the first opening. 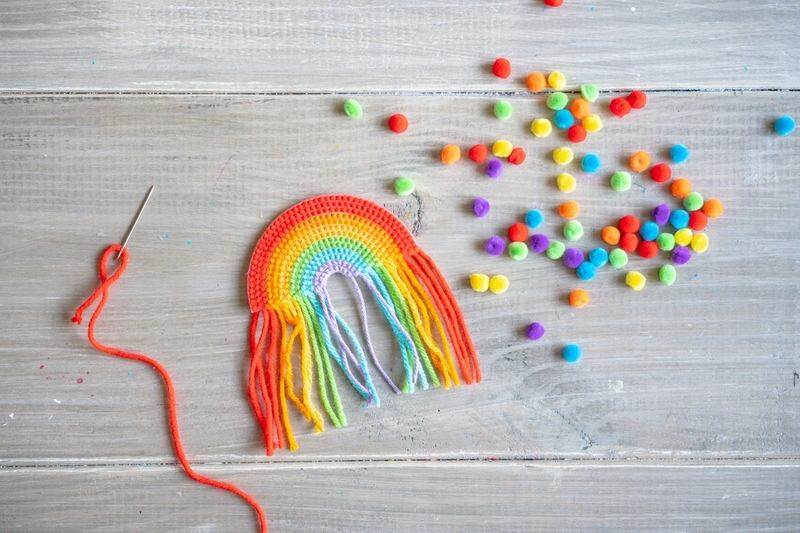 Pull the yarn through until you have a few inches left that will hang down on your rainbow. Wrap the thread around the bottom of the canvas to cover the plastic and back up through the first hole. Move to the next opening and continue going up through the back and then down through the opening below where you came up. Once you get to the other side, leave the extra yarn hanging. When you finish all of the rows, trim the center of the canvas if you didn’t fill it in all the way. Then, trim all of the hanging yarn to be the same length. You can add a loop of yarn to the top for hanging or add a magnet to the back for an adorable magnet. 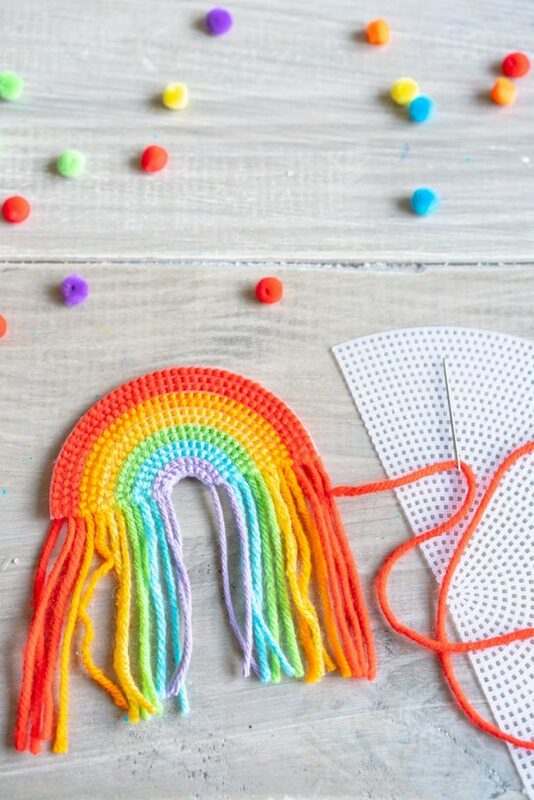 Did you enjoy this plastic canvas rainbow craft? Please share the love and pin it on Pinterest! This is so pretty. Thanks for the great idea! Thanks, it was a fun little project!